Among the numismatic treasures that will be featured in the upcoming inaugural exhibit of rarities from the privately owned Tyrant Collection (www.TheTyrantCollection.com) will be the largest display of English proof sets ever presented in the United States, including the complete proof set of 1746, the first ever struck as a set by the Royal Mint. The anonymous owner of the Tyrant Collection wants the public to see these coins in person for their educational value. Veteran professional numismatist and English coinage specialist Bruce Lorich, on behalf of the Tyrant Collection’s anonymous owner, has cataloged the more than 500 "Tyrants of the Thames" exhibit coins to be displayed at the Long Beach Coin, Currency, Stamp & Sports Collectible Expo (www.LongBeachExpo.com) in Long Beach, California, February 22-24, 2018. 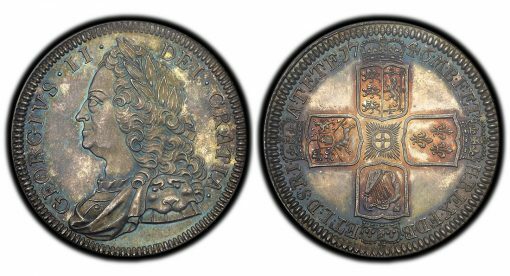 This is the third in a series of four articles by him about the historical significance of some of the coins in that unprecedented exhibition. One focus of the Tyrant Collection is the proof coinage of the Royal Mint. Many individual, early proofs and patterns in gold and silver will be included in the display, but a special portion of the exhibit will showcase complete sets. Most sets have long since been broken up, so this exhibit at the February 2018 Long Beach Expo is an unusual opportunity to view the sets as they were originally presented. The earliest proof set of England consists of four silver coins of King George II dated 1746. Only 100 sets were minted. Proof coins had never previously been assembled as complete sets and sold by the Royal Mint. The 1746 set consists of the crown, half crown, shilling and sixpence coins. All are certified and graded by PCGS, and the crown is graded PR-66, certainly one of the finest known. All the 1746 proof coins shimmer with original golden blue iridescent toning. The remainder of the sets in the exhibit were issued during the 19th and 20th centuries, as well as a few gold sets from the present century. These are more familiar to collectors, but only a few of the early sets in existence are still complete as issued. 1826 George IV Bare Head set in gold, silver and copper. It is believed that 400 pieces of each of the silver and bronze coins in the set were struck, but only 150 pieces of each of the four gold coins. So, no more than 150 complete original sets were made. The complete set contains 11 coins. In this set, the gold and copper pieces are matched for color, and the silver coins are all beautifully toned in shares of bluish gold iridescence. 1831 William IV set in gold, silver and copper, a total of 14 coins, all denominations except for the largest gold coin, the five pounds piece, which was not minted during this reign. For the first time, though, the four silver Maundy coins were included, bringing to a total of 14 the number of coins in this proof set. The mintage of this set was limited to 120 of each of the silver and copper coins, although 225 were struck of each of the three gold coins, the largest being the £2 piece. Therefore, no more than 120 complete sets ever existed, but almost all sets have been broken up. The gold and copper coins all have matching color, while the silver coins all possess brilliant neon-blue iridescent toning. 1839 Victoria Young Head set in gold, silver and copper. One of the most famous proof sets of England, with a mintage of 300. This is a full set of 15 coins: in gold, the famous £5 Una & the Lion, sovereign and half sovereign showing the queen’s youthful portrait, as well as the silver crown and its fractions including Maundies, and the copper penny and its two fractions. The originality of this set is attested to by the matched iridescent golden blue toning on the silver, the mahogany-brown color of the coppers, and the rich mirrored surfaces of the gold. 1853 Victoria Young Head set in gold, silver and copper. The mintage was a mere 40. The reason for issuing this set has never been revealed. One of the rarest of all English proof sets, this one is complete, containing 16 pieces: gold sovereign and half sovereign, silver crown and its fractions including Maundies and Britannia groat, and the copper penny, half penny, farthing and half farthing. Beautifully toned, the two gold coins are matching in color, the silver all possess golden bluish gray iridescence, and the coppers (not bronzed) show both original mint-red color and amber-green iridescence. 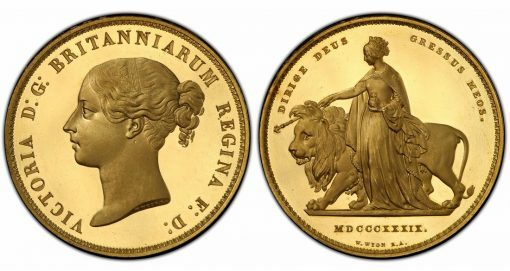 1887 Jubilee Head set in gold and silver. Gold proofs were limited to 797 pieces of each denomination, allowing for a maximum of 797 complete sets. No bronze coins were included this year. This is a complete set of 11 pieces: the four gold coins from the £5 to the half sovereign and the silver coins from the crown to the three pence, including the unusual double florin. Maundy coins were never included in this set. The gold coins have matching color and the silver pieces all have lovely golden blue iridescence. 1893 Veiled Head set in gold and silver. Gold Proofs were limited to 773 pieces of each denomination, allowing for a maximum of 773 complete sets. Again, no bronze coins were included this year. This is a complete set of 10 pieces, denominations the same as in the 1887 set except that the double florin was no longer minted. A matched set with beautiful iridescent toning on the silver. 1902 Edward VII set in gold and silver. A complete "long" set of 13 coins: gold £5 through silver including Maundies. Again, no bronze coins included. For the first time, the Royal Mint made proofs with matte finish instead of brilliant. Both "long" and "short" sets were sold to collectors at issue, the bigger set containing the gold £5 and £2 coins. 1911 George V set in gold and silver. A complete set of 12 coins: gold £5 through silver including the three pence and Maundies. Again, no bronze coins included. Brilliant finish. Identical color on the gold. Matching vivid blue iridescent toning on the silver. 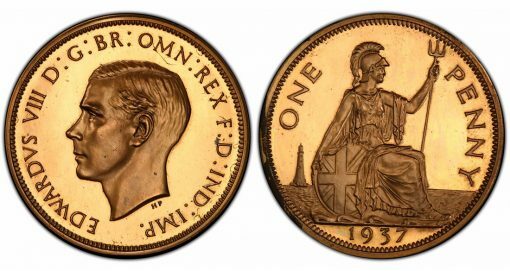 1937 Edward VIII set in gold, silver and bronze. A complete set of 13 pieces (no half sovereign was made). Struck in 1936. Brilliant finish. A superb set and the only one in private hands. This fabulous proof set will be specially highlighted at the exhibit. 1937 George VI brilliant-finish set in gold, silver and bronze. Complete set of 19 pieces: gold £5 through brass and bronzes. Issued by the Royal Mint for collectors in two parts, 4 gold pieces alone and 15 pieces crown through bronzes. 1937 George VI matte-finish set in gold, silver and bronze. Complete set of 19 pieces: gold £5 through brass and bronzes. A special, extremely rare set including all of the coins normally produced with brilliant surfaces. Of the highest rarity. Elizabeth II Proof Sets beginning with the Coronation set of 1953, displaying the queen’s changing portrait through the gold sets beginning in 1980 and continuing into the 21st century. All of these coins will be on display in the Tyrants of the Thames exhibition at the February 2018 Long Beach Expo. The one-of-a-kind exhibit is being presented by The Tyrant Collection’s anonymous owner with the assistance of Ira and Larry Goldberg Coin & Collectibles of Los Angeles. The 1937 Penny is one amazing design. Such craftsmanship. Would love to see this collection in person. Another reason to pass the coins down the family line.